A graduate of SJVS, an integral part of our school during the years her children attended here, and a continued supporter with her amazing graphic design talents, Cindy is this year’s Distinguished Graduate Award recipient. 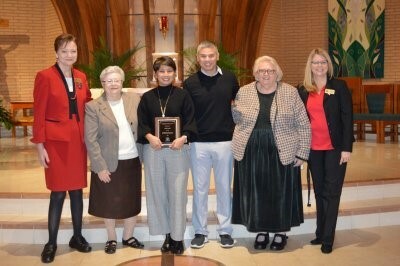 This award honors an outstanding alumni and is presented each year during Catholic Schools Week. Cindy Marfori ‘85 receives the Distinguished Graduate Award in January 27, 2019. Haley Wozniak '16 pictured with her tech support and fellow alum, Nathan Mohit ‘16. While working on her Girl Scout Gold Award, Haley initiated a program called Take Action For Autism with the goal of providing local elementary and middle school teachers different ways to teach children with Autism Spectrum Disorder and Sensory Processing Disorders. Speaking from her own personal experiences, Haley’s presentation helps teachers create a more successful classroom experience for these students. 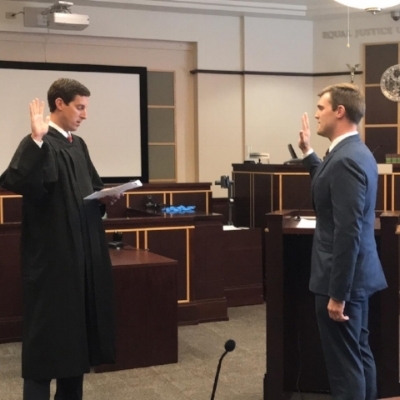 Lucien recently graduated from the University of Florida Law School and is working as an associate in GrayRobinson Attorneys at Law’s Orlando office. He focuses his practice on construction and other litigation matters. Prior to joining GrayRobinson, Lucien served as a summer associate in the Firm’s Orlando office. J. Lucien Johnson ‘07 at his swearing in ceremony. Sebastian Yrizarry ‘02 visits SJVS teacher, Kathy Foster with his fiancé, Caitlyn Gamache. Sebastian stopped by to share the news of his recent engagement to Caitlyn Gamache. The two met in LPN school a little over four years ago and plan to marry in the fall of 2019. After serving in the Navy for five years as an electrician, Sebastian decided to pursue a career in medicine. He is now an RN on the Progressive Care Unit at ORMC. Both are passionate about their careers and eager to tie the knot next year! Are you an SJV Alum? Let us feature you here. What year did you graduate from SJV? Yes! Include my information on this website page. Please add me to your Alumni & Friends News Flash mailling list. Sent 2-3 times each year.